My name is Lynette Holmes and I work as a practice nurse at a GP surgery in Sheffield. I’m married to Simon and we have 2 children – Rhys age 11 and Luke age 7 our Wilms Warrior. Luke was diagnosed with a Wilms Tumour aged 5. Luke was sent home from school on the Friday afternoon with a tummy ache and that night he started complaining of severe right sided abdominal pain. On admission to the hospital Luke had presented with a hernia in his groin but the pain was so severe that the consultant wasn’t convinced that the hernia was the cause of the pain. An ultrasound scan the following day confirmed every parent’s worst fear – Luke had a tumour the size of a grapefruit on his right kidney. Our world came crashing down. One CT scan and biopsy later confirmed a Wilms Tumour. The CT also showed 3 hotspots on his right lower lung which were cancer. Following surgery for his hernia repair and port inserting, Luke began chemo, pre-surgery, to shrink the tumour then a right nephrectomy would be performed. A CT scan pre-surgery showed that his lung was clear – it had reacted exceptionally well to the chemo, the surgeon who removed the tumour said it was dead when it was removed. This was all positive news for us. Luke recovered very quickly after the op and he was soon up and about. 6 months of post surgery chemo was commenced and he also received 3 weeks of radiotherapy to the site where the kidney was. Luke actually enjoyed radiotherapy, he called it the Ben 10 machine! We finished treatment in February 2011 and Luke is now coming up to 1 year in remission! He is now very well and enjoying being 7 again, he’s back at school full time and apart from slight stiff legs from vincristine, so far he has no other side effects. I have spoken to lots of people, some in their 40s who had a Wilms as a child, and they are all well with no medical problems – their solo kidneys have never given them any trouble! I have also spoken to families of children who have been diagnosed since Luke, as I would have found this support helpful when Luke was diagnosed – you feel so alone when you are told your child has cancer! Luke is currently on 3 monthly follow ups of ultrasound scans and chest x-rays but I’m told these will start to get further apart. We are all looking forward to a healthy 2012. Because we live in Sheffield and Luke’s chemotherapy was as an outpatient we never had to stay at PACT house although I have spoken to many parents who did not live in Sheffield who found the house a necessity and a welcome escape from the hospital. The Holmes family have attended 2 Christmas Parties organised by PACT – both were magical, Luke and Rhys both enjoyed the games, food, winning on the raffles and most of all meeting Father Christmas himself ! Thank you PACT ! 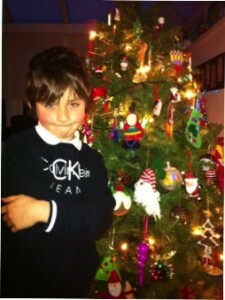 The picture is of Luke at Christmas 2011.